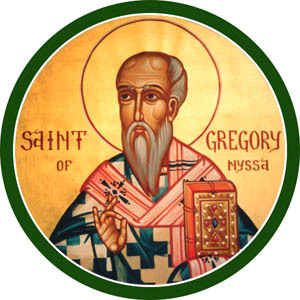 In his commentary, Gregory of Nysa – whose feast is today, January 10th – skipped the second beatitude in order to ask a question about the third beatitude: Is it a step down from the first beatitude? From kingdom of heaven down to earth? But didn’t the Word come down to this earth, to meet our lowliness? Didn’t he call himself “meek”? And what is this earth that the meek inherit? Is it the polluted earth that we are destroying in our lack of meekness? No, Gregory says, it is “the land which is not cut open with the plough of evil, which does not produce thistles and thorns, but is the land of the water of refreshment and the green places, where springs up the fourfold fountain and the vine that is tended by the God of all creation… the land that is fruitful in good things, where the tree of life waves its leaves, which is watered by the fountains of spiritual graces. It is the land where sprouts the true vine”…in other words, Christ himself, who is the true vine. It sounds rather like the kingdom of heaven, doesn’t it? So the earth that Gregory envisions is the redeemed earth, the transfigured earth, the earth of the new creation where Christ himself will rule and we with him in perfect stewardship of the land. Does it sound like mythology? Perhaps, but Gregory goes one step further, and this is not mythology! He says, quite correctly, that every human being is able to move his/her free will in two directions. Our human nature is quick to turn toward evil and destructive behavior. The opposite is to act slowly and calmly, and steadied by reason. Unlike other Fathers of the Church, he does not say we should strive to kill our desires and inclinations (what they called the “passions”) – but rather that we exercise moderation, and that we take things slowly and think through our choices. This is meekness, in Gregory’s thought. The elimination of desires and passions is against nature, Gregory asserted! But moderation and meekness are not against nature – they are very definitely within the powers of human nature. Gregory was remarkably optimistic about what is within our reach. We also need to be optimistic. If we are to be poor in spirit and meek, we need to be positive/optimistic about our lives and the life of the world. Only the meed will inherit the earth. I prefer to say: MEEKNESS WILL INHERIT THE EARTH!! Only meekness will make the earth something that we can inherit with Christ. Only gentleness will save us from destruction. When we meet anger with anger, violence and hatred with violence and hatred, we are not meek and there will be no earth to inherit. When we don’t walk softly and meekly on the planet, we are on the fast track to environmental collapse – and there will be no earth to inherit. While Gregory sees the earth that the meek will inherit as essentially the same as the kingdom of heaven, I prefer to see this beatitude as a challenge to us to live and act in a manner that will make the earth something worth inheriting. The Liturgy is our Eucharist – our thanksgiving for the gift of life, the gift of the earth, the gift of fellowship with God through our Lord Jesus Christ. The Liturgy teaches us to be thankful. Only an attitude of thankfulness can lead to meekness. Only when the earth itself becomes our Eucharist, that we receive from God and offer back to God, can the third beatitude become reality. The meek WILL inherit the earth, if there is an earth to inherit. That’s why I prefer to say, MEEKNESS WILL INHERIT THE EARTH!! Indeed, meekness and gentleness will SAVE the earth. Let’s walk gently on this our precious planet. And it will be ours to inherit in glory and transfiguration. Categories: Sermons | Tags: environmental gentleness, free will, Gregory of Nyssa, meekness, third beatitude | Permalink.